House Training Dogs...A Second Time Around! My Cocker Spaniel Is Messing In My Kitchen! Please, I need your help! My 3-year old cocker spaniel is messing in my kitchen and I don't know what to do about it. He doesn't just pee, he's pooping too. I've tried all the leading scent removal products, with no luck at all. My dog is fed early in the day so it gives him plenty of time to do his business, but I still wake up in the mornings to a mess in the kitchen. You don't say whether your cocker spaniel has just started to mess on the floor or whether he's always done this, so I'm assuming that he was previously house-trained and he's only just begun to do this. 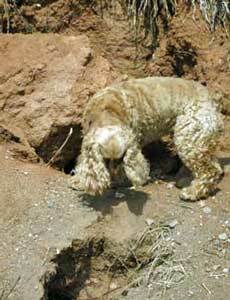 In order to resolve this problem, we need to work out what is causing your dog to suddenly behave in this way. Then we'll be in a position to deal with it. My first word of advice would be to have your vet check him out just to make sure that everything is in working order down there and that there are no health problems. Okay, here are some of the likely causes for peeing and pooping in the house. Stress, brought on by change, can cause a dog to misbehave in this way. Has there been any trauma that could be causing your dog to behave in such a way? For example, moving house, changes in the household, changes in routine, death of a pet, etc? Changes like these often upset our pets and they and react in many ways. If there have been changes in your household, perhaps this could be why your cocker spaniel is messing in your kitchen? Is he getting enough attention? Peeing and pooping is often used by dogs to get their owner's attention...and it certainly works! If you think this is that case, give him some regular 'quality time' with the family. Personally, I think he may be 'protesting' at being left in the kitchen. Dogs like to be with their pack (that's you and your family) and I think that's why he doesn't mess in the bedroom or when you sleep on the settee. Would your wife accept it if he slept in the bedroom, but in his own bed? That might be a happy compromise. Have you recently changed his diet? This might be causing him to mess. It's always best to change your pet's diet gradually. Is he fed at regular times during the day - you say he's fed in the morning, but is he given anything during the day? Dogs either eat one whole meal per day, or have their meal split into two meals per day, with a few treats in between for good behavior. The key is to be consistent with meal times. Exercise helps to keep our dogs regular. Cockers need at least an hours' walk during the day and a short walk (or let into the garden/yard) at night to allow them to empty their bladder before bedtime. If you don't already do this, try removing your dog's water bowl after 6:00 or 7:00 pm (don't forget to let him out to empty his bladder just before you go to bed). Just these two simple tasks can help to keep him dry and clean during the night. If the dog scent cleaners/removers aren't working for you, then it may point to his protesting at something that's recently happened. Does he have his own crate? If so, try locking him in that overnight - it may 'force' him to hold himself (as dogs avoid messing in their own den). If you'd like a refresher on potty training and crate training your puppy or dog, just follow the links. Our cocker started doing this as well. But only at night when he would get up to go out. I changed our floor cleaner to one that did not have ammonia in it, and after a week, he stopped. Just my own personal thought, but I think that in the middle of the night, he used his nose, and could smell the ammonia and figured that is what his bathroom smelled like. My cocker spaniel is messing in the kitchen!